Paperless Warehousing Signature Warehouse Management System has been developed by warehouse people for warehouse people. We bring you the change management expertise that wins with those on the shop floor. We also offer you continuity wherever possible with the same people working with your people through the scoping, training, integration and Go live stages of your WMS project. Our logistics software solution has earned the appreciation of Warehouse Supervisors, DC Managers, Logistics Managers, Operations Management and Senior Management alike. Real world warehousing and logistics insight and operational experience is built into the PW modular solution. That’s what makes our applications so suitable for all logistics operations in all types of environments and industries. Our Signature WMS (Warehouse Management System) consists of applications for all warehouse and logistical operations. For this reason, we can link the system into your existing ERP system (with full EDI links in various formats in transportation or down to base CSV files) or run it as a multi-functional stand-alone system that can grow and evolve with you as your needs change. Our "building block"modular approach ensures that there areboth affordable entry level options as well as fully-equipped more powerful ones available that meet every requirement. And, as demands on your warehouse increase as your business requirements change and expand, the Paperless system remains flexible and powerful enough to grow and evolve along with your needs. In the rare case, we don’t have the functionality you’re after, we’ll custom-build it for you to your unique requirements. If clients prefer, our signature WMS package can also run as a web application along with other cloud services and this may be a suitable option for businesses with IT strategies that are moving toward the cloud. Clients may set up their own private cloud server on either Amazon Web Services (AWS) or Azure and our 'WMS in the Cloud' can be a helpful tool for them to transact in this cloud services environment. Whether you need a Basic or anAdvanced TMS integration, we can help. A TMS can either sit between the ERP and a Warehouse Management System or it can be an extension to the WMS and interactively talk to the WMS only, with the WMS also talking to the ERP. A TMS is an enterprise-grade vehicle scheduling and routing system utilising track and trace technology that is open and flexible. In addition, itallows quick deployment and smooth integrations with GPS trackingand many others. In the Basic scenario, the WMS will interface by conducting one-way communication with the TMS module. While, in a more Advanced situation, the interface allows information to be relayed both ways, back and forth, feeding each module information that can then be used in decision making. Paperless provides clients with a seamless yet comprehensive interface to a variety of TMS (Transport Management Systems) that are either Basic or Advanced. This expands your control onto the truck and onto the final delivery. As well as being a real-time system, breaking the often-arbitrary distinction between primary and secondary transport, Paperless WMS works with your TMS to allow you to keep track of all resources while carefully monitoring real-time constraints and ensuring data is correct and valid. In the circumstance where you’ve not yet implemented a TMS, we can suggest reliable alliance partners and bring them to the table. Optricity™ is a third-party expert optimisation solution that works with the Paperless WMS. When dealing with huge numbers of SKUs, expansion, and ever-changing seasonality, warehouse optimisation becomes increasingly more important. Optricity™ functionalityallows you to utilise advanced slotting technologies to provide an optimally slotted warehouse which helps you address operational and product seasonality challenges. Optricity™ addresses the complexities of slotting by using advanced mathematical algorithms, which consider a product's dimensions like weight and velocity, physical characteristics of your environment including slot configurations, pick path and material handling equipment, as well as operational goals like pallet building, seasonality requirements and retail groupings. We offer “best in class” interfacing with standard interfacing via XML with a full suite of menu options to easily configure to suit respective client needs. Further to this we have our Integration Services module which is a proprietary translation tool that allows whatever format and transportation out of the ERP, CRM, Point of Sale, to interface seamlessly with the PW WMS. We have provided solutions and interfaces to a wide variety of Host and/or ERP systems including: SAP, JDE, Oracle, Microsoft Dynamics AX, Microsoft Dynamics GP, PRONTO, GP Sage AccPac, and NAV, MacPac, Attaché and many proprietary systems. 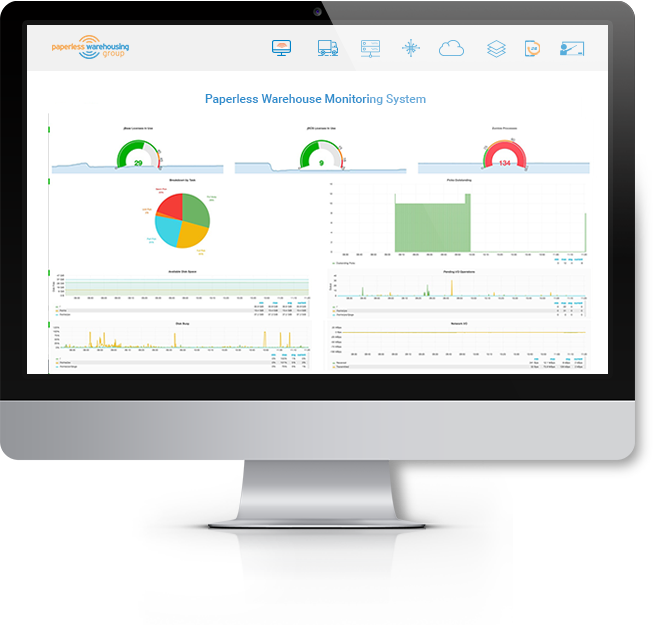 Our Monitoring Services module is an application monitoring service for your WMS. We offer a live, 24/7 application monitoring service of the PWG WMS application and its critical services. The service monitors and provides email notification alerts of any system and warning issues, which if left unaddressed could lead to high-level incidents. This ensures critical issues in your background process such as backups, host communications, receiving and order releases, replenishment, event stacking, licence usage and write failures are monitored, captured, communicated, and addressed before they become major issues impacting your operations, customer service, or bottom line. Monitoring service’s reliable efficiency and productivity are key in delivering optimal benefits for you, so our 24/7 monitoring and communication of issues is a built-in safeguard to ensure your system performs at its best. Our Data Warehouse leverages the power of BI tools such as;Microsoft Power BI, Cognos and CoreView, just to name a few. This type of reporting can demand a lot of database resources. So, with the integrated BI tools, reporting happens through an SQL relational database that stores and receives data from the main WMS database and then processes it rather than tying up the main operating database to perform these tasks, freeing it up to perform at its peak efficiency. Whether you are a top-level supply chain executive with the overall flow of goods from conception to customer, or a warehouse operations manager with inventory fulfilment operations, BI tools can be configured to track critical performance metrics and provide a user defined level of business intelligence across your supply chain. Your real-time supply chain data is used to calculate the performance that returns savings to your company's bottom line. This is an extension to the suite of reporting tools that are already built into the PW Signature WMS functionality. Training is a unique requirement and we work with you to define your specific training needs. Our in-house experts are available to provide detailed system training. Training can often be the ticket to organisations getting the most out of the Paperless Warehousing Management System because it’s so powerful and always expanding and evolving. If you want a better understanding of Warehouse Management Systems, an improved knowledge of our software and the facilities available within your system, then contact us and we will work with you to find the best option possible to meet your needs. 1. What is the Paperless Warehousing WMS? Our Warehouse Management System (WMS) is a tailored software system for the running of any warehouse or area which stores product. It interfaces with RF mobiles, printers and host systems for a seamless operational experience. Paperless Warehousing was started in 1988 and has been in continuous business ever since. We have seen much change over these years and have ensured we are at the forefront of the latest technologies and processes through continual research and development. 3. What support do I get? We fully support all our own software with our own people. You can be assured that when you need support, you will speak to us directly. We do not use 3rd party call centres or support staff. This level of service separates us from our competitors. 4. Can I buy only one module? There is the base system you purchase and then can elect which modules you also may want. The core system will handle most basic and complex warehousing operations. Extra modules might include options for 3pl, billing, truck and yard management or multiple interfaces. 5. What interfaces do you support? We support 99% of all known interface technologies and types. 6. Do you sell other software and services? Yes. We have a number of other products and services we can offer. These include a full manufacturing management system, IT managed services, training and logistics consulting. 7. What payment options do you offer? There are a number of options you can use to purchase our system. We provide everything form Capex submission, through to lease agreements and monthly rental for fixed terms. 8. Can I see your system in operation? Yes. As part of our sales process, we encourage prospective clients to visit some existing sites and see the system in operation. 9. What does you system cost? Our system is fully configurable and tailored to each individual operation and warehouse. For information on specific pricing please contact one of our sales team. 10. What do I need to implement paperless? The most important thing is a desire to implement a leading edge and robust WMS. Based on your existing system, there may be computer hardware, RF mobiles, Wi-Fi access points and other equipment needed. From our perspective, a dedicated project team and manager will ensure a successful implementation. 11. Do you offer training? Yes. We will provide full training on all our system tailored to your specific needs and setup. Again, this will be provided by Paperless Employees so you know you will be getting quality and expert tuition.